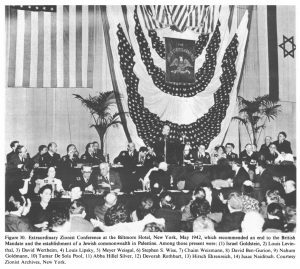 Seventy Five years ago this week, in early May 1942, hundreds of American Zionists convened in New York City in Manhattan’s then-famous Biltmore Hotel for an extraordinary gathering (photo below). 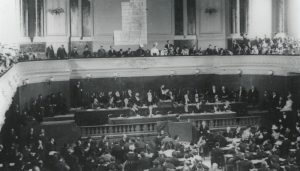 This assembly, at the time the horrors of the Holocaust in Europe were becoming fully known, has been recognized as the “Biltmore Conference” and as a seminal moment in Zionist history.  On this occasion, The American Zionist Movement (AZM), the federation of Zionist organizations in the United States, created from among those who convened the Biltmore Conference, launches a “Year of Zionist Anniversaries”. 70th anniversary of the founding of the State of Israel in May 1948. Through this upcoming “Year of Zionist Anniversaries” AZM will conduct programs and events across the country about Zionism in partnership with its 25 constituent agencies and in cooperation with the broad spectrum of Jewish communal agencies. 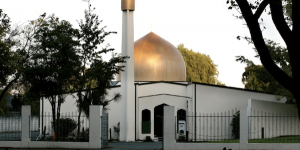 There will be programs related to Zionism held with public officials, schools, synagogues, summer camps and with many community institutions and organizations. 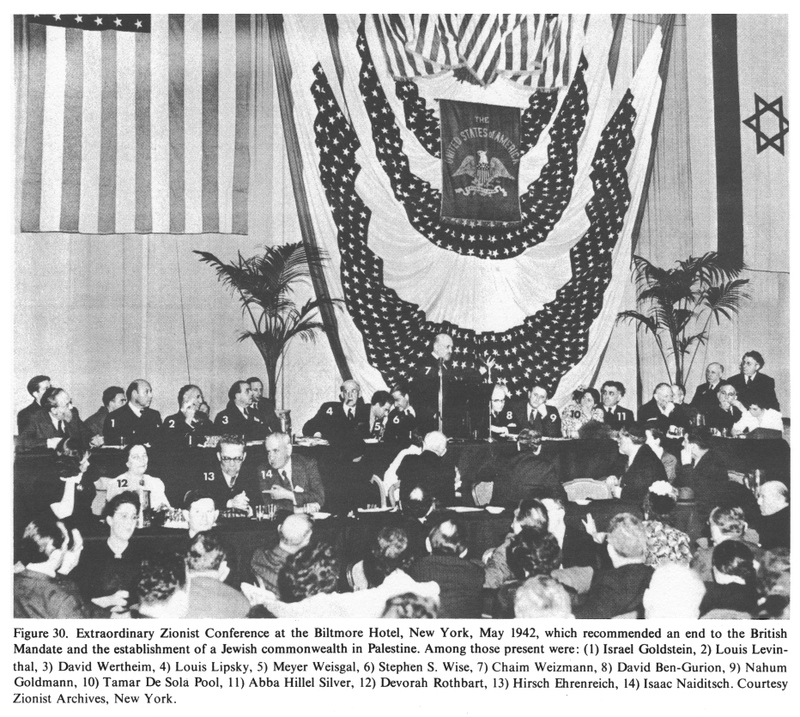 It was at this historic Biltmore Conference 75 years ago, addressed by Chaim Weizmann and David Ben-Gurion (who would later in the decade become Israel’s first President and Prime Minister respectively), that 600 American Zionists issued the Biltmore Declaration which formally called for the founding of a “Jewish Commonwealth” in the land of Israel, then under the British Mandate. This declaration also expressed the solidarity of the Jewish people around the world, especially with those suffering under Hitler in Europe, and expressed a desire for a future Jewish state to live “in full cooperation” with its Arab neighbors. Just five years later, also in New York City, the United Nations adopted the Partition Resolution which lead to the end of the British Mandate and the creation of the independent State of Israel a few months later, immediately recognized by the United States and freedom loving nations of the world. One hundred and twenty years ago the Zionist movement formally came together under the leadership of Herzl. Zionism is rooted in a belief stretching back thousands of years that the Jewish People have a right to sovereignty in their ancestral and indigenous homeland. It was at the Biltmore Hotel, then located on 43rd Street & Vanderbilt Avenue across from Grand Central Terminal, that the movement united in seeking the “fulfillment of the original purpose of the Balfour Declaration” to form the Jewish Commonwealth, now the modern State of Israel.